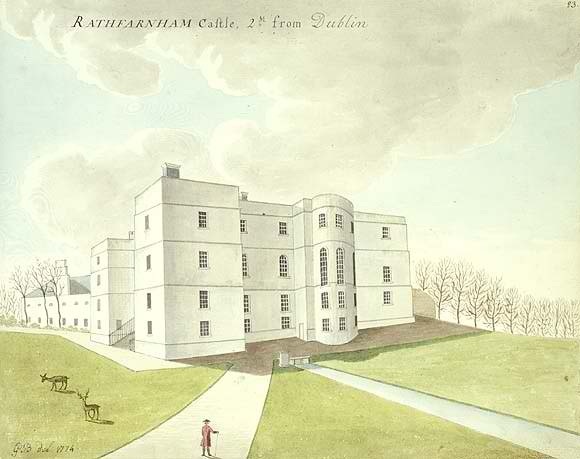 Rathfarnham Castle, County Dublin as depicted in a watercolour by the Huguenot artist Gabriel Beranger in 1774. It shows the structure, built around 1583 for Adam Loftus, Lord Chancellor of Ireland and Protestant Archbishop of Dublin as a semi-fortified residence, after it had been extensively altered by his descendants in the 18th century. In state ownership since 1987, today and tomorrow Rathfarnham Castle is the venue for the Period Buildings Show, an event organised by the Irish Georgian Society & South Dublin County Council, in partnership with the Office of Public Works. Ireland’s leading conservation practitioners will demonstrate everything from sash window repairs and stained glass and fanlight conservation to stone carving and traditional wallpaper making. Inside the house will be talks on a variety of topics relating to conservation. The occasion ought not to be missed especially since, mirabile dictu, admission is free. This entry was posted in Architectural History, Country House, Dublin and tagged Architectural History, Architectural Restoration, Dublin, Georgian Architecture, Irish Country House, Irish Georgian Society, Rathfarnham Castle.